Burlington’s Old North End is a neighborhood of diverse people living in close company—multi-generation Vermonters, newly resettled refugees, college students glorying in their first apartments, young families rehabbing old houses. On a side street near Pomeroy Park, you’ll find the four-square, concrete-block home of a distinguished UVM economics professor, past provost, and longtime member of the City Council. 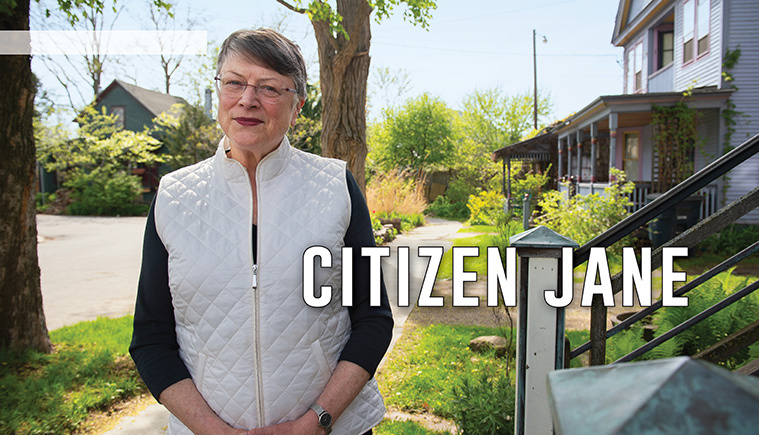 Jane Knodell says the ever-changing diversity of this neighborhood is a key attraction that drew her here, keeps her here, and motivates fighting the good fight to make the Old North End, and the entire city, a great place to live. When Knodell joined the UVM faculty in 1986, her department chair encouraged her to reach beyond campus with her expertise, “get involved.” With interstate banking under debate, it seemed a likely opportunity for an economist to offer testimony at the statehouse. In Burlington, Knodell began to share her perspective with city government during the Bernie Sanders and Peter Clavelle administrations. She also hit the sidewalks to leaflet for Progressive Coalition candidates. When someone suggested she make her own run for the council, Knodell said, “OK, sounds good. I can do that,” she recalls with a quiet laugh. So began years of community service in multiple roles, two decades on the Burlington City Council at the core. That work finds its way back into UVM economics courses. “I feel like it has helped me in the classroom to be more connected to the so-called ‘real world,’ to see how things really play out, how businesses think,” Knodell says. In recent years, she has drawn on her many contacts in public service and non-profits to develop an internship-based course for top econ majors.